Just received this from our friends at The Overlake School in Redmond, WA. 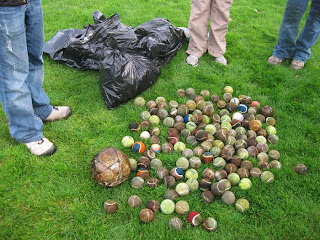 On Halloween a group of 12 upper school students and a teacher paddled, in costume, on the Sammamish River and hauled out a bunch of garbage, 1 soccer ball and 148 (!) tennis balls. Well done gang! The tennis balls are the downstream result of a dog park at Marymoor Park in Redmond. When a dog doesn't bring back a ball, guess what? It goes downstream, eddies out, and begins to rot. Thanks again to the students at Overlake for helping keep our local waterway clean. It really does make a difference for all of us, human and other species, who spend time on the river.